From street work and excavation to building retaining walls and driveways and just about anything in between, our professional and experienced team at California Shine Construction will complete almost any concrete construction project you need. 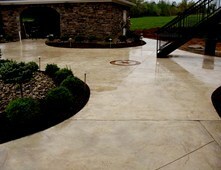 As a full-service concrete contractor, we specialize in residential concrete work. We will work with you to make sure your concrete construction project is properly completed. Our professional and capable teams have both the knowledge and experience to complete almost any type of residential concrete construction project imaginable. We have a full-service approach to each project we complete. This means that we work with you from start to finish on your concrete construction to make sure that the finished product is of the highest quality. As with all projects, we will not consider your concrete installation or repair complete until you are completely happy with the results. As an experienced concrete contractor, California Shine Construction is always focused on quality workmanship on each and every concrete construction site. Our years of experience in concrete construction mean that we use only the highest quality materials while remaining within your budget. We also guarantee that we will stick to the established timeline we set with you. For your concrete construction needs, California Shine Construction is the perfect solution. Give us a call today to get started with planning your concrete construction project. We guarantee we will complete your project according to your budget, timeline, and goals. Call California Shine Construction for your project in the Fresno, CA area.